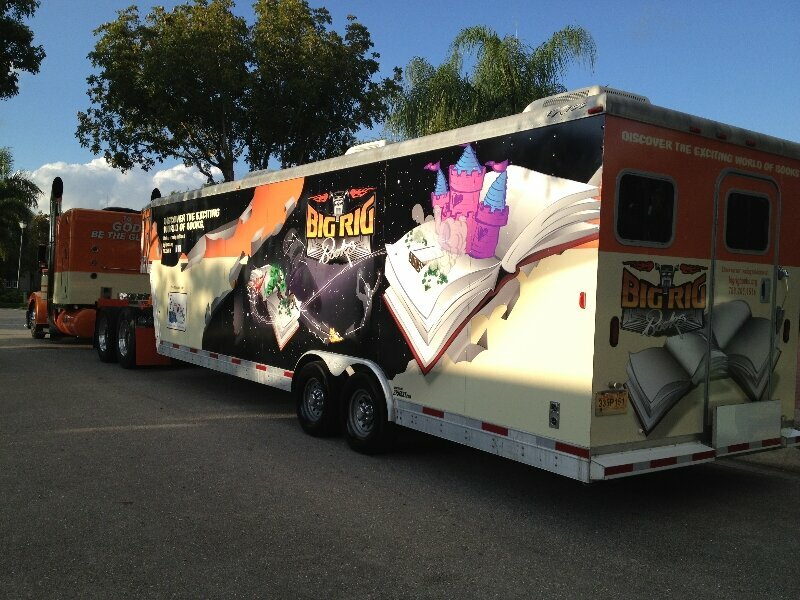 “Both teachers and students raved with excitement about the Big Rig Books program. What you are doing to promote a love of literacy is nothing short of incredible and we are so grateful for the time and commitment you have made to our students”. "Thank you for giving us new books. You are my encouragement to keep reading. Please continue to do good things. You've encouragedme and I am sure my class will be encouraged as well. Thank you for your kindness and generosity". "I didn't like reading and now I do. Thank you, Big Big Books". "The partnership we have with you is such a benefit in the lives of our students. To watch the students reading their books and asking to begin a book club using the books they selected is indeed a delight! As a summer school teacher at Kolmar school, I just wanted to extend an additional thank you for your donation to my students today! They were beyond excited with the books they were able to take home and so eager to spend the day reading. It's nice to see struggling readers begging for extra reading time. What a wonderful program you are running!!! I have a kindergarten class and they are still talking about the books they received! Your books will be treasured for a long time to come. Thank you! Thank you for all of the wonderful books you shared with us. Your kindness is very much appreciated! My son and I had a blast on your bookmobile. Thanks for being so kind to my son. He will certainly enjoy the free book you gave him. The Big Rig was a huge success. The children talked about the books to anyone that would listen and the little ones even showed their books to other visitors in the building. They told them about the Big Truck with books and the nice people that gave them a free book. Thank you for giving me two free books! It is very generous of you to come to our school and give every class the chance to have a book to take home. This opportunity is huge for all of the students because not every student has books to read at home. Thank you again for taking the time to come to our school and giving kids free books. I just wanted to thank you for the books that you gave me. I really appreciate you giving us two books. Now that I have books that I can read every day, because I just stay inside seeing TV and doing nothing. I can practice my reading, thank you. Thank you SO much for visiting our school twice to share the gift of reading with us through your donation of books. Your Big Rig full of books was one of the highlights of the summer! Thank you!! Your truck is amazing and it was so nice of you to provide a book to all the athletes in attendance. They were so happy and proud of the books they picked out! Thanks again for making this a special day! Thought you might find the attached of interest... "For children who need it most-poor children-well-thought programs provide broade-based support, but one intervention that has proved to work well in stemming reading loss is ensuring that young people have books to read. Library reading programs work - but for many kids in big cities, getting to a library can be impossible. The key, according to experts such as Richard Allington, a researcher at the University at Knoxville, is making sure that children have access to books they want to read. Book giveaways work." Source: The Washington Post 6/12/2013 You are certainly on the right track for making a difference. Thank you again for all of your efforts with our students. I can't tell you how greatly I appreciate your efforts. Thanks again for all you do and enjoy the rest of the summer. On behalf of the Village of Midlothian and the Community Policing Committee, THANK YOU!! The children loved the books and were very excited. We feel that you are doing a wonderful and amazing service to the children. We can't wait to give back! 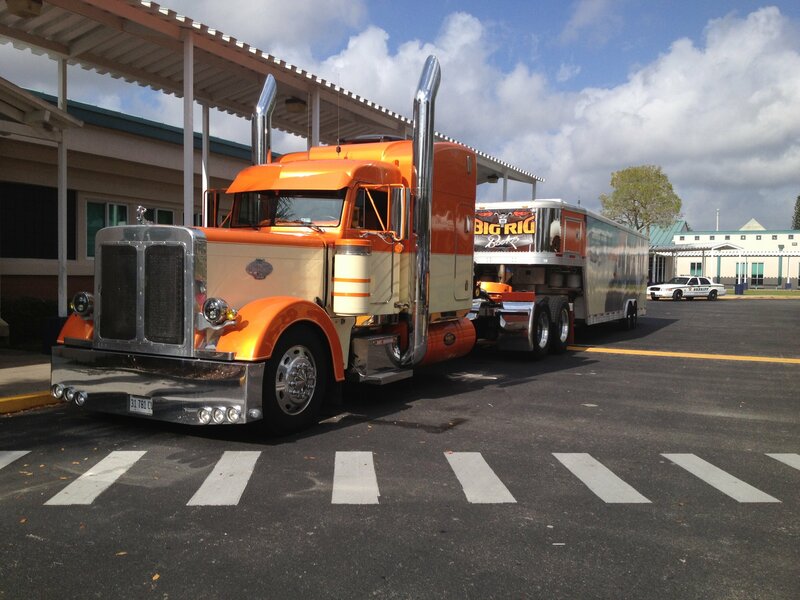 I had the honor of coordinating three Big Rig visits to Fort Myers Middle Academy, and they were truly amazing visits. Our students were excited to have the opportunity to walk through John’s truly unique mobile library and pick any book they wanted. We saw students who, much like John in his childhood, avoid books find the excitement of reading and discovering great adventures between the covers of the books.Fort Myers Middle looks forward to having John and his big rig return again next year and will work to find ways to also help replenish his supply of books. We truly appreciate your visits. Many of my parents who came on Back to School Night last week asked about the books their child had brought home. I explained about your Big Rig Books truck and your mission. They were very impressed and very thankful that you are doing this. My students loved the books they chose from the Big Rig. Most of them took their books home but a few kept them at school. They bring their books out most days during our D.E.A.R. time (Drop Everything And Read). Thank you again for your time and generosity. We look forward to visiting with you again. On behalf of the Community Consolidated School District 180 Board of Education, I would like to thank you for the generosity and dedication to education that you have extended to the students at our district. Thank you for your graciousness and your generous donation of thousands of books for our hundreds of students. I know that the happy look on a child's face when they select a book of their very own must be tremendously satisfying, but on behalf of the board i would like to add my thanks for your tireless efforts. Your dedication to the children and our (and other) schools serves as a model and an inspiration for all of us associated with Burr Ridge CCSD 180. We look forward to working with you as we continue to provide outstanding reading opportunities to our students and their families. The students were incredibly happy to be able to choose a book and take it home. There were a lot of choices and everyone left with a book they were excited about. As a teacher, I liked the fact that they were able to really think about what book they could get and make a choice. I loved that the couple expected them to say "thank you" because it is a skill I start working on at the beginning of the year and this was a nice "outside the classroom" opportunity to practice. They loved the dog and having him there provided a good opportunity to use some vocabulary (body parts and size). The couple was great with the kids. Thanks again. 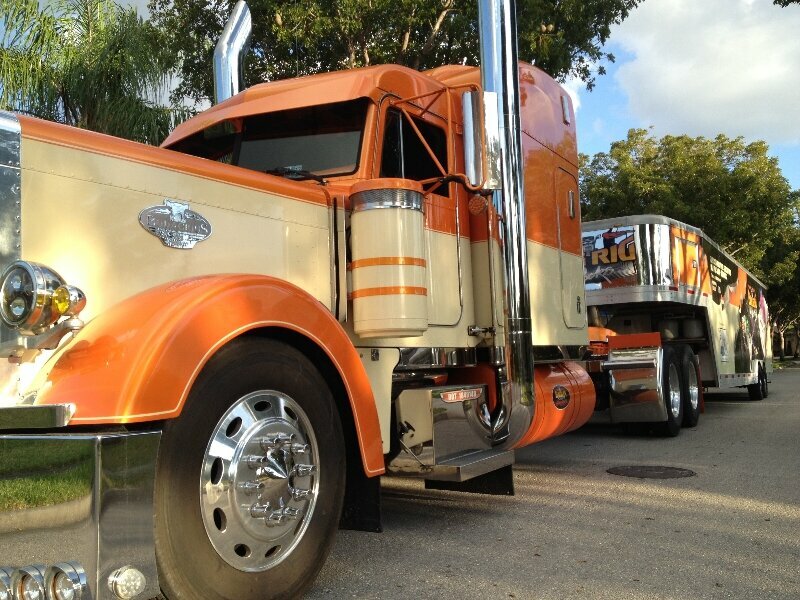 "We really liked the (Big Rig Books) experience. The books were separated so the students knew where to look for their level. They were also very excited about their books and couldn't wait to get back to class to read them." 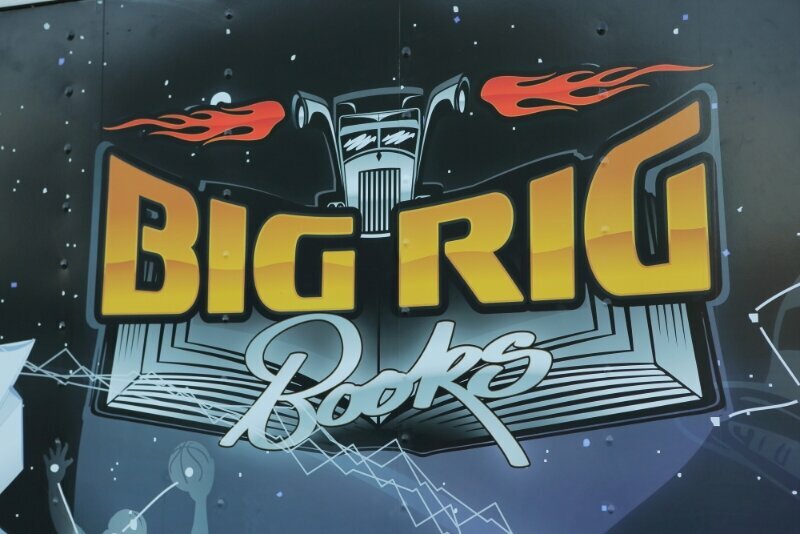 "We thought the Big Rig Books experience was great! I hope we get to see it every year. The students really enjoyed seeing books that had been read to them." We are proud to have you as a partner in making literacy a number-one priority this school year. Your contribution to literacy inside and outside the classroom is critical to the success of young learners. I want to thank you for coming to the Union League Boys and Girls Club on July 7th. When I arrived at the club that afternoon, I saw the children all sitting and reading their new books. They could hardly put their books down long enough to work on their art project that day. All the children wanted me to see which book they had chosen. Thank you again for showing this great act of kindness and generosity to our club members and encouraging their love of books. What a great day! Teachers came up to me after school telling me how wonderful you and Kathy are, and how happy you made their students. We are very much looking forward to you returning to our school. The scholl is still buzzing about the event and our teachers and students were so appreciative of your generosity. Your mission of getting books into the hands of those in need aligns with all of the work we are doing to foster the love of reading across our school. As a teacher and a parent, I really appreciate your mission. My daughter, Janaye, looks forward to Monday's when the Big Rig comes. As a teacher Isee the joy when my kids choose their book and are excited! We need more people like you in our community. Emily was so excited this morning when she remembered you guys were coming. She was even more excited when she found a book I used to read when I was her age! Thank you for everything you do for these kids!!! Thank you SO much for taking the time to come to Cicero East today. Our students and teachers both absolutely loved the experience and are truly grateful for your kindness and generosity! All the students are super excited to read their books which is great! 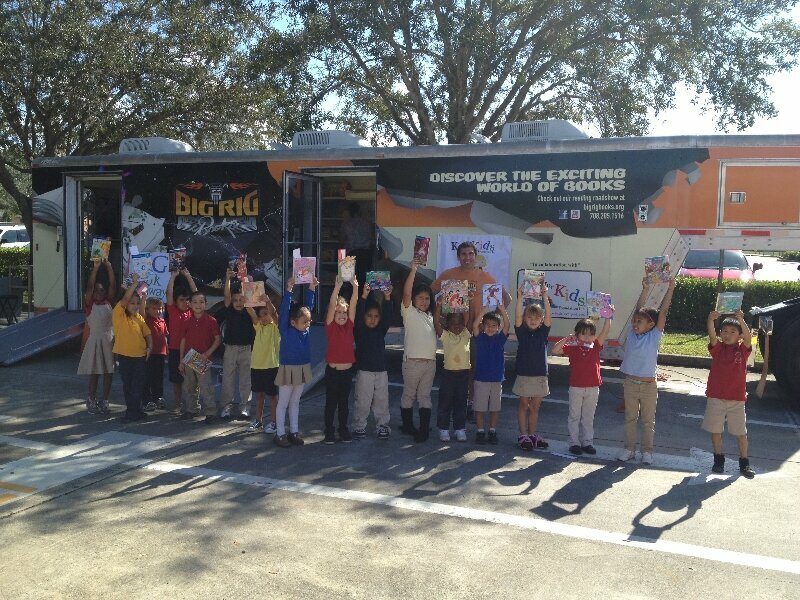 The Tortuga Preserve family of students and staff would like to thank you SO VERY MUCH for allowing our students to visit and receive a book from your ‘Big Rig.’ They absolutely loved the experience and appreciate their new book! I appreciate all that you do! Thank you again for serving our school – from all of us! We cannot thank you enough for supplying all of our students with a free book. They really enjoyed your visit and were thrilled to receive a book. On behalf of the 24th District Commander and Officers of the Community Policing Office, we would like to take this opportunity to thank you for your generous assistance and donation to the annual "BAck to School" event which took place August 15, 2015. Our "Back to School" event was able to provide well over 400 youth with food, fun and an abundance of school supplies. Franklin Park Elementary would like to thank you for your visit in November. It is so wonderful that all of our students received a book to tak ehome. I was so tickled to see students reading their chosen book before school the very next morning! As a reading coach, there isn't much more that can excite me than seeing students with their noses in a book or sharing interesting pictures or facts with a friend. We are truly thankful for the generosity Big Rig Books offers so many young minds. The teachers, students and myself always look forward to your visit. 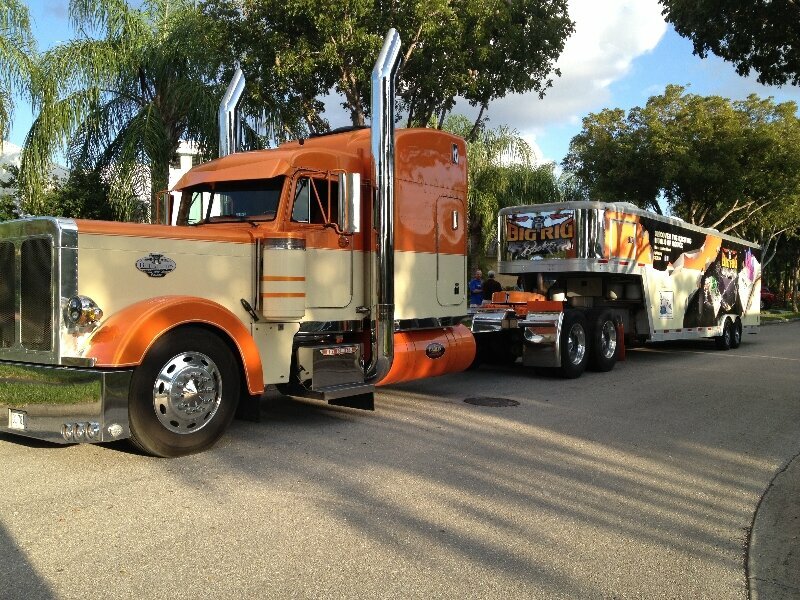 John and Kathy, We wanted to thank you again for bringing the "Big Rig" to our school! It means so much to all of us! Your kindness and compassion are unmatched! Enjoy your summer! My students were delighted to be able to choose a nearly new book from your wide range of interests and topics. 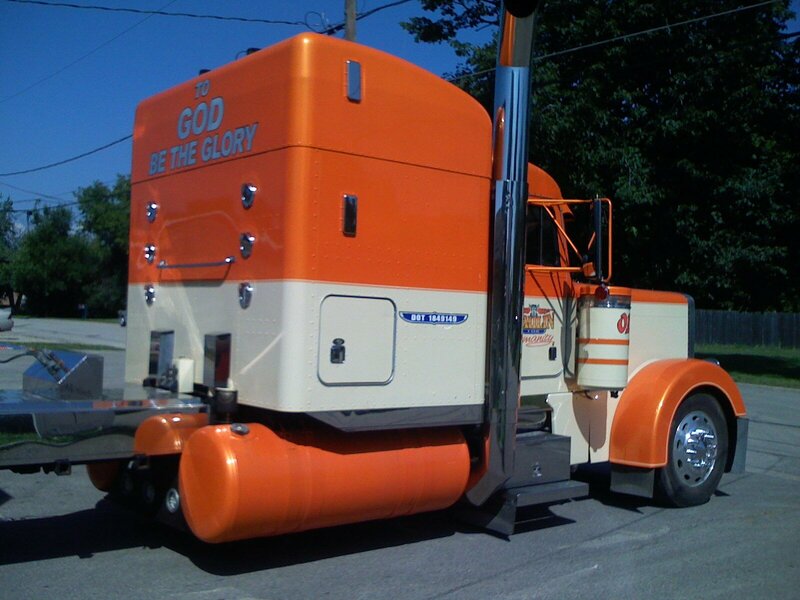 The truck part just makes it that much neater for them! Every year we enjoy this experience immensely, and are thankful you continue to visit. Keep up all the good work, you're changing lives, one book at a time. THANK YOU SO MUCH FOR AGAIN COMING TO OUR SCHOOL. I AM SO THRILLED TO SEE THE EXCITEMENT OF MY STUDENTS IN BEING ABLE TO SELECT THEIR BOOKS TODAY. ALSO, WE APPRECIATE YOUR GENEROSITY-NOT JUST ONE BOOKS, BUT THE ABILITY TO SELECT THREE BOOKS TO TAKE HOME EAS AMAZING FOR MANY OF THEM!! TO SEE ME JRH BOYS SHOWING EACH OTHER THE BOOKS THEY WERE ABLE TO SELECT AS THEY WAITED FOR THE REMAINDER OF THE GROUP WAS GREAT TO WITNESS! The students and staff at Charles J. Sahs school are very appreciative of all of the wonderful books that they received through the Big Rig! The students were very excited to get to visit the Big Rig and they couldn't believe their good fortune to receive three books! I have enjoyed seeing their books come back and forth to school during summer school. We hope that you enjoy the cards and letters that are enclosed. 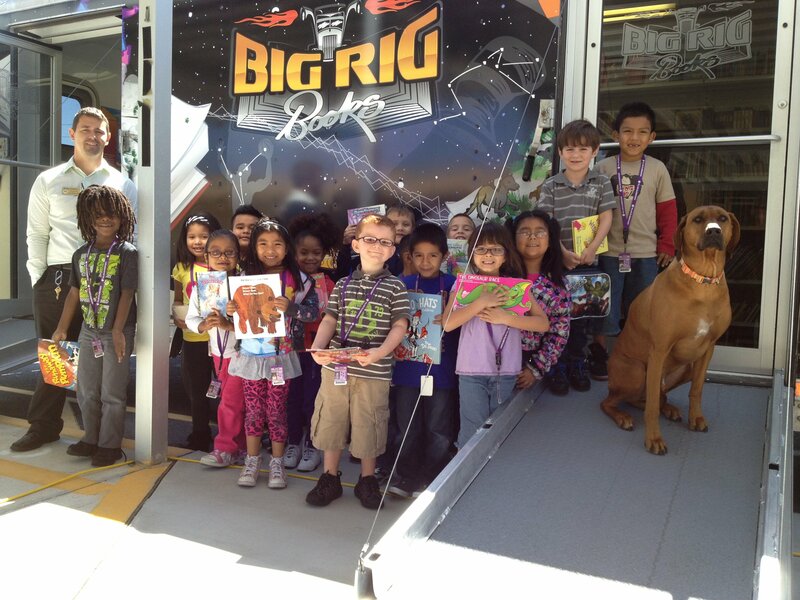 We are appreciative of all of the work that you do to keep the Big Rig stocked with wonderful books for children. We hope that we are able to work with you again in the future and have you return during the school year so more of our students benefit from this experience. “Your presence made this event successful beyond all expectations…we look forward to working with you and Big Rig Books in the future”. “I have never seen my students so excited about reading! What a joy to witness my intensive reading students become excited about being able to choose a book of their own liking and being able to keep it, FREE! I can’t express my gratitude enough. This is the beginning of their own personal library”. “The look on the faces of our students when they saw the BIG RIG was amazing! It’s a unique and beautiful transformation to get books to underserved communities. When our students found they would receive a free book, their excitement was beyond belief. Many thanks to John and Kathy for their thoughtful, generous and most creative way to promote literacy”. “I have heard so much positive feedback from the teachers. My only complaint from the other teachers was, ‘why didn’t I get to go’, and I have assured them that you are coming back and will get to everyone." “It was an incredible day for our students! Their smiles said it all: we look forward to next month! Please know that we are very appreciative of this opportunity for our kids! Your presence here with the BIG RIG was an inspiration for our kids to start their own family libraries and to read, read, read!!!" “This experience will forever be cherished in my heart. I am so thankful that you are doing this. I promise to read everyday and improve my reading. 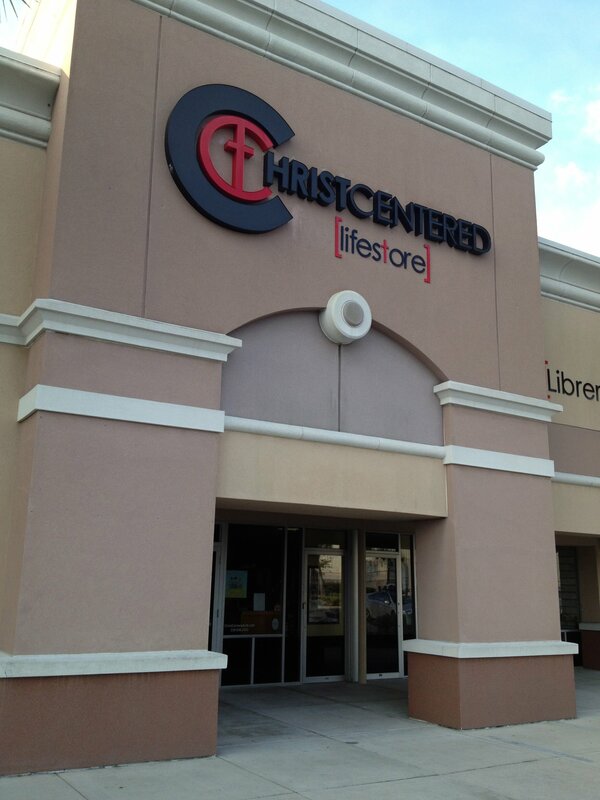 I am so grateful that you are doing this for kids that can’t afford books”. “Thank you so much for your book donations. I love books and I pledge to always read them because books are just amazing. I think it is amazing how you can have so many books in one truck. It is very generous and kind of you to donate so many books to kids”. “It is obvious you value education and have a commitment to help students reach their potential. The key to success is reading and offering them books is a wonderful way to foster the importance of reading in their lives”. “Thank you very much for what you are doing for these kids. My son has been eagerly awaiting you, and enjoys reading his last book, which means a lot to me! As a single mother, I’ve learned first hand that life is rough, more so with lack of education. Thank you for helping make reading fun for my little guy and his sister, who is in the ESE program. May God bless you and multiply your generosity”. “As any high school educator would tell you, having students who struggle with reading actually wanting to read is a watershed moment in any school. Your visit gave us that moment! For that I am grateful as are the staff and students that benefitted from the “Big Rig” being on campus. I am looking forward to your return to the home of the "Jaguars”.